DW Drywall Truck - Roll-A-Way Conveyors Inc. 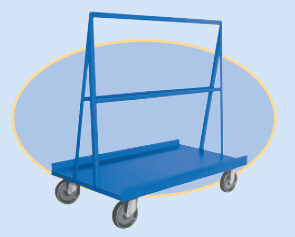 These angle frame Drywall trucks transport wall board and other clumsy and oblong materials. 12 gauge all welded steel construction with reinforced understructure. 8” x 2” Plexite phenolic resin wheels standard. Bumpers optional. Powder coated blue.